Our Beacon Schools (2017-2020) project is funded by an anonymous donor and is implemented in partnership with one of our newer partners, Joshua Foundation. 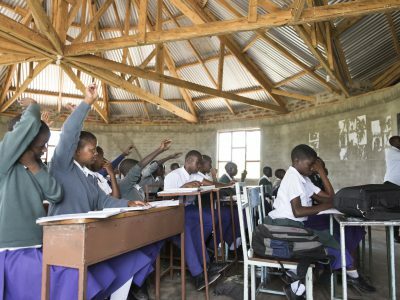 It takes place in seven primary schools in three districts (Karatu, Mbulu, and Longido), and helps to support primary school children, teachers and head teachers, and district education officials. Beacon Schools develops and supports centralised primary school teacher training, focussing on participatory teaching practices which includes gender sensitive, child protection and disability-inclusive approaches. If girls (and boys) can be shown to succeed in school, this will reinforce the recent progress made around access to formal education. If marginalised communities, such as the Maasai in Tanzania, can secure a quality education for their children, this will support their ongoing struggle to maintain sustainable livelihoods in a rapidly changing world. Children are not acquiring foundational skills of literacy and numeracy in Tanzania’s primary schools. Moreover, poor teacher incentives, including teachers being placed in isolated rural schools, poor housing and high student-teacher ratios is an issue. Reasons for low quality education are many and complex; they include poor English language by both teachers and students, large class sizes, uninspiring teaching pedagogy, low expectations of children, and the relatively high costs of education for families living in, or on the edge, of poverty. Girls with disabilities face additional layers of discrimination due to disability and gender bias. This is reflected in lower rates of enrolment and poorer learning outcomes through a combination of challenges; less attention from teachers, less access to assistive devices and rehabilitation, and higher rates of drop-out due to cultural practices such as female genital mutilation. benefited from improved quality of teaching and safer, more engaging and inclusive lessons; 1,301 of these pupils were girls. received training which has resulted in greater classroom involvement, and 46 teachers are now capable of supporting participation of students through group work.